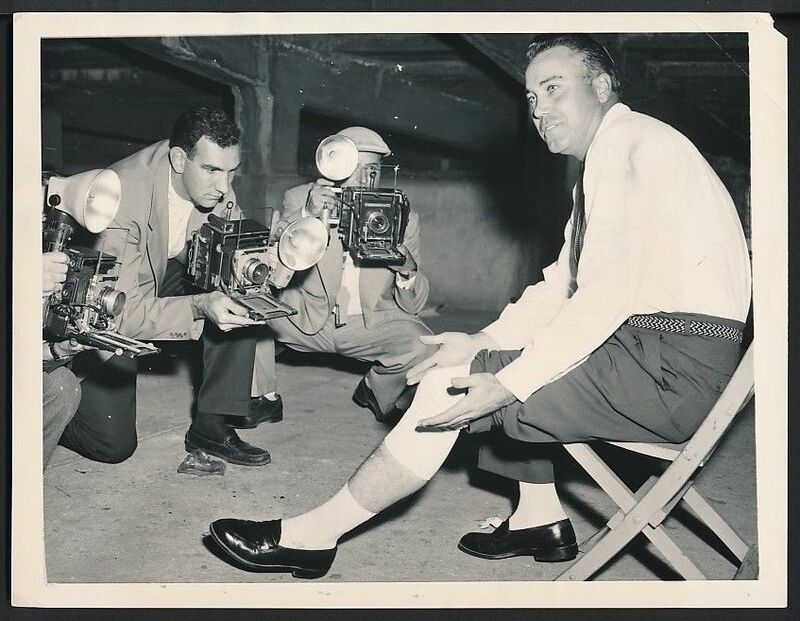 Dodgers' Duke of Swat, Duke Snider, shows his bandaged knee top press photographers in the Dodger dressing room after the sixth World Series game today which the Yankees took 5-1 to even the series 3-3. Snider told reporters: "It's my left knee that's hurt, the one I pivot on, but I'll play tomorrow of it doesn't stiffen up." Snider twisted the knee chasing a Skowron fly and left the game after the third inning. This Day in Dodgers History: In 1941 the Dodgers traded for soon to be Hall of Famer Arky Vaughan with the Pirates in exchange for Pete Coscarart, Luke Hamlin, Babe Phelps and Jimmy Wasdell. In 1998 the Dodgers signed free agent starting pitcher Kevin Brown to a seven year $105 million contract. In 2012 the Dodgers received Skip Schumaker in a trade with the Cardinals -- sending Jake Lemmerman to St. Louis in return. Happy Birthday, Phenomenal Smith, Derrell Griffith & Orlando Hudson! Here's a fun post regarding about the size of the Dodgers farm system in the late 40's. Via Jon Weisman at Dodger Insider; "You call that a farm system? This was a farm system." Just a part of the rumor mill. Via Buster Olney at ESPN; "MLB Roundup: Dodgers will pay if Justin Turner stays in L.A."
The Dodgers are increasingly confident that they will re-sign free-agent third baseman Justin Turner to a multiyear deal, according to a source familiar with their thinking, which would be a big development for a team badly in need of a middle-of-the-order right-handed hitter. BTW, "Dodgers outright Charlie Culberson, opening a spot on the 40-man roster," via J.P. Hoornstra at Inside the Dodgers. This move opens up room to sign a free agent. RIP, Glen Van Proyen. Via Jon Weisman at Dodger Insider; "Former Dodger scout passes away." Paredes was drafted in the Triple-A phase off the Tigers' roster. He's pitching in the Dominican Republic as well for Escogido and threw a scoreless inning on Thursday. The 30-year-old, originally signed out of the D.R. in 2005, has been spotless in winter ball, not allowing a run in 11 innings while striking out 16 and walking two. Paredes has bounced through five organizations now and independent ball, but a Dodgers scout clearly saw something in winter ball to recommend him. Paredes has issues with command because his low slot is tough to repeat, but throws a slider with 2-8 shape that is rough on lefties. Stealing Home at All Trade Bait, All the Time talks about his recent outing to Dodger Stadium; including getting an autograph from a former Dodger. Via Eric Avakian at Dodger Blue; "Dodgers Video: Corey Seager Appears In MLB The Show 17 Gameplay Trailer." Via Ken Gurnick at MLB.com; "Puig reflects on homeland in documentary." Dodgers outfielder Yasiel Puig talks about fulfilling his Major League dream and his desire to play for his native Cuba in the World Baseball Classic in a new episode of "MLB Network Presents" titled "Cuba: Island of Baseball," which debuts Tuesday at 6 p.m. PT. Via Cary Osborne at Dodger Insider; "Rivals in college, top prospects Buehler and Sborz now motivate each other as Dodgers." Thanks for Staying Blue, Kenley Jansen!